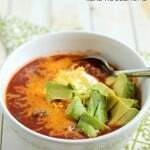 This flavorful and hearty Slow Cooker Chipotle Ale Chili with it's little kick of heat will soon become a family favorite. 12 oz bottle of a medium or dark ale I used a bourbon ale. Heat the olive oil over medium-high heat in a medium skillet. Once the oil is heated add the onion, green pepper, and garlic. Saute for 2-3 minutes. Place the veggies into your slow cooker. In the same pan over medium-high heat, quickly brown the ground beef. You do not have to cook it all the way through. Add the browned beef to the slow cooker as well. Pour in the bottle of ale, black beans, crushed tomatoes, and chili powder. Puree the chopped adobo pepper and sauce with the apple cider vinegar, and then add to the slow cooker. Mix the ingredients well. To serve- ladle into bowls and top with sour cream, shredded cheese, and avocado, if desired.